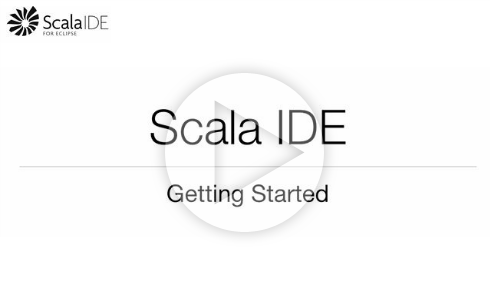 If you are new to Eclipse or Scala, watch the “Getting Started with the Scala IDE”. This screencast will guide you through the installation of the Scala IDE for Eclipse, and you will also learn how to create and run your first Scala project. This release is only available for Eclipse 4.6 and can be retrieved as zipfile. This release is only available for Eclipse 4.x and can be retrieved as zipfile. The 3.0.3 release is the third maintenance release of the 3.0 version. It is available for Scala 2.10, on Eclipse 3.8/4.2/4.3 (Juno & Kepler). The 3.0.4 release provides the same features as 3.0.3, but the code was updated to support Scala 2.11. See the Changelog for a complete list of changes. The 3.0.1 release is the first maintenance release of the 3.0 version, and is the last one compatible with Eclipse 3.7. JDK 6 (JDK 7 can be used but there have been issues reported when using Eclipse 3.7 with Java 7, e.g., 1 or or 2 if you are on MacOSX - a workaround for the latter issue is described here). Eclipse 3.7 (Indigo). Read here if you have questions about the supported Eclipse packages. The 3.0.0 release is the last supporting Scala 2.9, and is available for Eclipse 3.7 (Indigo) or Eclipse 3.8/4.2 (Juno). This release is available for both Scala 2.9 and Scala 2.10, and both Eclipse 3.7 (Indigo) and Eclipse 3.8/4.2 (Juno), through different update sites. Support for Eclipse 3.8/4.2 is experimental in this release. JDK 6 or JDK 7 can be used. Eclipse 3.8 or Eclipse 4.2 (Juno). Read here if you have questions about the supported Eclipse packages. JDK 5 or JDK 6 (JDK 7 can be used with some caveats). Eclipse, including the JDT. “Eclipse Classic” is sufficient, but any Eclipse package can be used. Both Eclipse 3.6 (Helios) and Eclipse 3.7 (Indigo) are supported.